A free, public evening of poetry and music to commemorate the Easter Rising Irish rebellion of 1916. 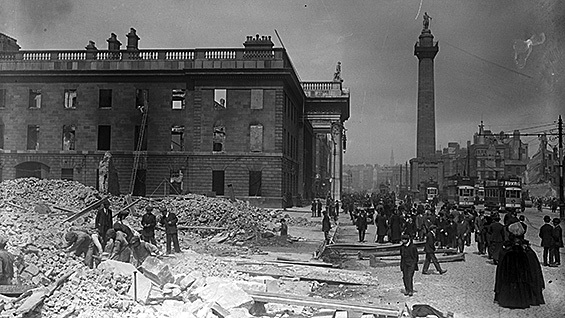 Ireland's Easter Rising was preceded by a cultural revolution in which The Abbey Theatre was founded "to bring upon the stage the deeper emotions of Ireland." The rebellion itself was led by a group that included many poets. On the centenary of the Rising, in which New York played an important role, the Poetry Society of America presents an extraordinary evening of Irish and American poetry and music. Spoken word performances will be by Louis de Paor, Timothy Donnelly, Theo Dorgan, Eamon Grennan, John Montague, Paul Muldoon, Leanne O'Sullivan and Maria Tucci. The evening will include music by Mick McAuley, Susan McKeown and The Murphy Beds. This event is sponsored by The Poetry Society of America, CualaNYC, Poet's House, Culture Ireland and The Cooper Union Department of Public Programs.